President Obama is embarked on a major charm offensive with the business sector, as seen, for example, in the appointments of William M. Daley (formerly of JPMorgan Chase, now White House chief of staff) and Jeffrey R. Immelt (chairman and chief executive of General Electric and now also the president’s top outside economic adviser). This should not be an uphill struggle – much of the corporate sector, particularly bigger and more global businesses, is doing well in terms of profits and presumably, at the highest levels, compensation. But when exactly will this approach deliver jobs and reduce unemployment? And does it increase risks for the future? Republican rhetoric over the last two years was relentless in its assertion that the Obama administration was antibusiness. Supposedly, this White House attitude undermined private sector confidence and limited investment. In the wake of Jeffrey Immelt’s ascent to the chairmanship of President Obama’s jobs council, some commentators have questioned whether the leader of General Electric, a company that has sharply reduced its United States payrolls over the years, is the best person to be orchestrating a jobs revival. 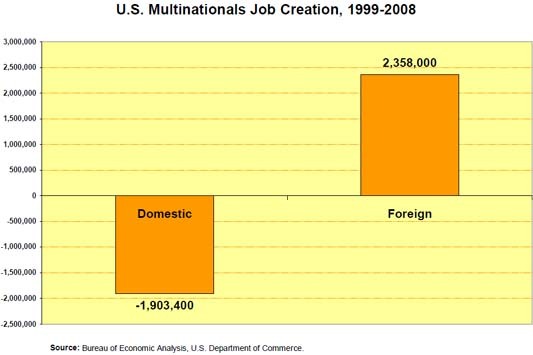 The chart is taken from testimony by Martin Sullivan, an economist and contributing editor with Tax Analysts, in a discussion of how international tax rules favor foreign, rather than domestic, job creation, especially by United States multinationals. So the CEO of one of the largest multinationals on the planet is now advising the President on jobs creation. The same guy who led that company to move thousands of jobs out of the U.S. and create new ones in other countries.But it’s not enough that Immelt’s the wrong guy to ask about how to create jobs. The President is asking the fox for advise about protecting the hens. Rampell also points out how one of Immelt’s pet proposal that he’s been pushing for a long time is for a “tax holiday” that allows U.S. based multinationals to repatriate foreign profits to the U.S. without paying tax. In many cases the “foreign profits” of these multinationals are actually U.S.-earned profits that have been laundered through foreign subsidiaries using a variety of tax dodges and artificial internal transfer prices (see Dutch Sandwich for one example of how Google got it’s U.S. tax rate down to 2.4%). So at a time when we are supposedly concerned about the deficit, the President is turning to one of the biggest tax dodgers around: GE. To add further injury, let’s consider the inherent conflicts of interest. GE, despite it’s recognizable brand name among consumers and it’s heritage as Thomas Edison’s creation, is not a the entreneurial industrial competitor it once was generations ago. GE doesn’t really compete in capitalistic free markets for consumers’ attention to make it’s money. GE works the government. One of GE’s largest subsidiaries is also one of the largest military contractors dependent on the pentagon military budget. Up next is the power generation division is dependent on subsidies for the promotion of clean and renewable energy. Another huge subsidiary is the medical devices unit which sells primarily to hospitals and doctors who in turn bill Medicare and health insurers – and healthcare spending is driving the fed government spending. The NBC subsidiary depends on the FCC for favorable decisions and protection from competition. And finally, the last major subsidiary is the financial services unit which benefitted from the bank bailouts. Let’s face it, GE is a giant that depends primarily on the federal government for support. Yet, not only is Immelt, the GE CEO in a position to have the President’s ear on economic and budget issues, he’s doing it without resigning from GE. Can we all say “conflict of interest” folks? The other appointee, William M. Daley, is resigning (for now) his position as a senior executive with JPMorgan Chase, the monster bank that the Feds bailed out and then they fought financial reform. Let’s be real. Daley’s job lasts at most 2 years. Then he needs another job. He knows that. He also knows JP Morgan Chase will likely hire him back at a much increased salary – if he gives advice to the President favorable to JP Morgan Chase. This isn’t representative democracy. This isn’t even rule by some technocratic advisors. This is crony capitalism, rule by an oligarchy. The entire infrastructure of the USA seems to be being affected by the lack of ethical behavior at nearly every level of society. Every military weapons and nuclear facility is in need of reclamation in an environmental context. Resource limitations can be anticipated to be a serious problem even if the world-wide US-initiated destructive military actions were curtailed tomorrow/today. The absence of confidence in the leadership seems to be evidenced by numerous reports via the internet, while the MSM seems to be concerned with entertainment and other forms of diversion. Were it not so depressing, these might be exciting times!